Believe it or not, there are still some people who scratch build their own model airplanes or build kits that require bending and even soldering music wire for making landing gear. I fall into that category, although I occasionally buy a pre-built model to use while projects are on the building board. 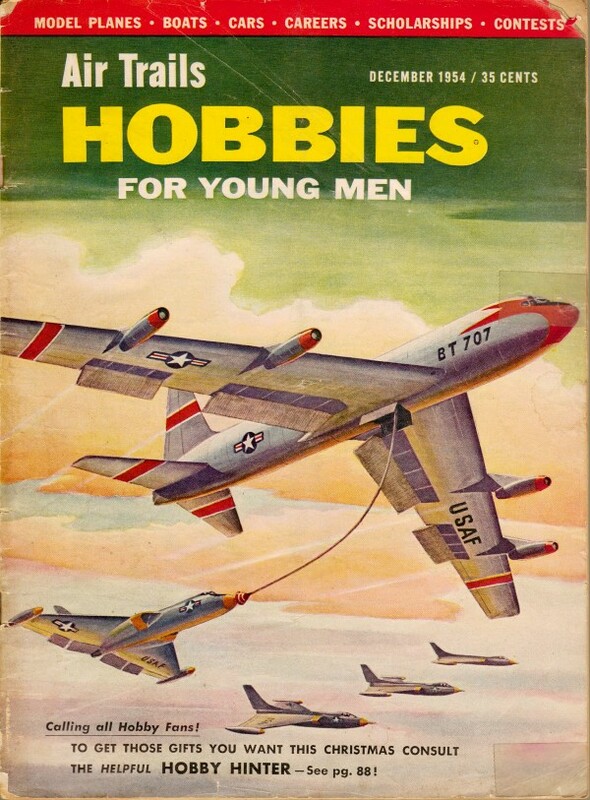 This article from a 1954 Air Trails has some handy tips and illustrations to help someone doing doing landing gears for the first time and maybe even for seasoned landing gear builders. In fact, after reading this article, I implemented step #8 that shows a good way to assure that the wheel retaining washer is soldered perpendicular to the axel. If you do not use a jig of some sort, the surface tension of the molten solder tends to pull the washer askew because of the proximity of the bend in the wire between the wheel axel and where it leads up to the fuselage. The phenomenon occurs because the natural action of the solder is to minimize surface tension everywhere, so that angle perturbs the solder flow. 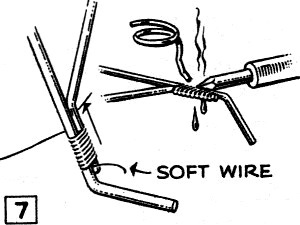 Skewing does not happen when you are soldering a washer at the end of the wire where all the angles (90°) are the same. Most landing gears for gas model planes are made of steel wire. It is the most durable, the simplest, and no doubt the best all-round type gear for either free flight or control line models. Once a few knacks are mastered, even beginners can produce excellent landing gears, and the same knowledge of wire bending, cutting and soldering is applicable to the building of take-off dollies and other miscellaneous wire parts in all types of model airplanes. 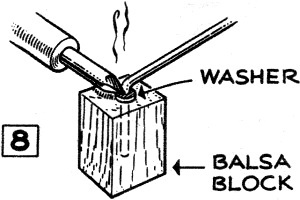 Tools and materials needed are a bench vise - the larger the better - a hammer, cold chisel, file, soldering iron, resin - or acid-core solder (or bar solder and a paste flux), and copper or annealed wire for binding. Lightest A/2 models may use 1/16" diameter steel wire or even smaller; mid-sized models generally call for 3/32" diameter; larger jobs use 1/8" and occasionally 3/16" diameter steel wire, and the heaviest models sometimes resort to two- or three-strut steel wire gear types. Bending wire properly is the fundamental thing. 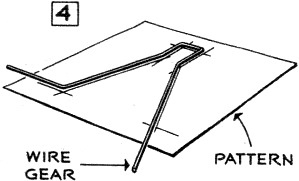 Avoid sharp, right angle bends (1) in fashioning cold wire as this often produces fractures which can cause subsequent failure. Instead, bend the wire with a small radius (2) to avoid trouble. Sharp bends when necessary, however, can be made if the wire is first heated, bent and then retempered by heating red hot and quenching in water. 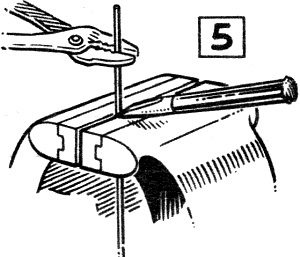 With one end of the wire held firmly in the vise jaws, the other can be bent by hand with a few licks of a hammer near the bend (3). Have a paper gear pattern nearby (4) and check the accuracy of the part by superimposing it from time to time. Small corrections in the angles can sometimes be made with heavy pliers, depending on wire size. (5). The wire end to be cut off should be held by someone with pliers. 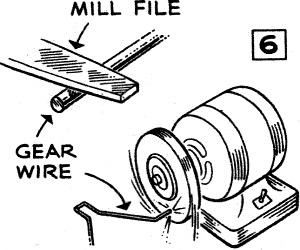 Ragged ends of the cut wire should be dressed down uniformly with a file or on a grinding wheel (6). When struts are joined, sand the wires to clean them for soldering, bind them neatly and tightly with soft annealed wire or copper wire, then sweat solder through the binding for a sound joint (7). 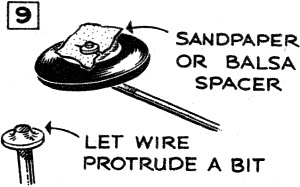 Good soldering requires a well "tinned" iron which really gets hot, and the surfaces must be free of all dirt. Clean washers and axles with sandpaper preparatory to attaching the wheels. 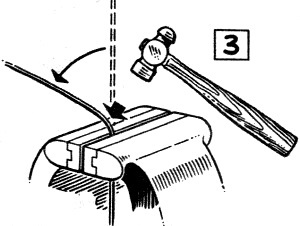 The axle end can be forced into a soft balsa block after the inner washer is slipped onto it (8). The block positions the washer and holds it perpendicular during soldering. If acid-core solder is used, carefully wipe all traces of the acid away with a cloth; coat with oil. See that the wheels fit the axles snugly but freely, bush them with thin wall tubing if necessary, then slip on the wheels. With a piece of thin balsa or sandpaper as a spacer between the outside of the wheel hub and the washer, solder the washer in place (9). Finally give the plane a careful top and front view inspection for wheel alignment (10). From the top view slight "toe-in" can be tolerated and from the front a little "camber" if desired in order to prevent the wheels splaying out. 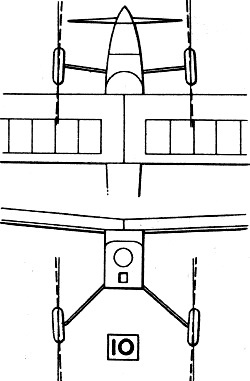 Later we will discuss landing gear types, how to fasten them to the fuselage, shock absorbers, wheel "spats," etc.